Fix It In The Mix. . .
Our very busy '70s decade ended with some great surprises. 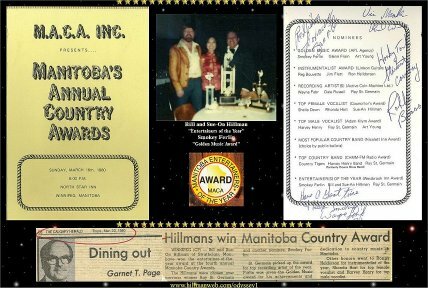 We were aware of the MACA (Manitoba Association of Country Artists) Awards which were held annually at an awards show in Winnipeg. 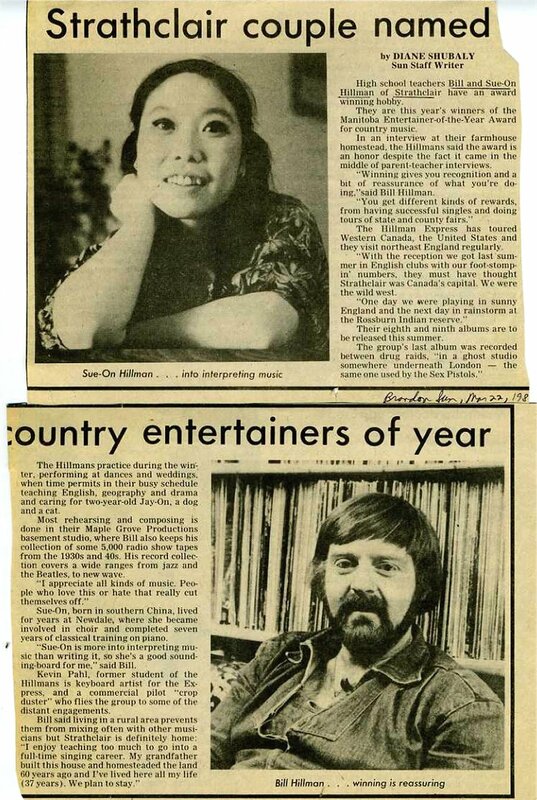 It came as a bit of pleasant shock, however, when we received word from their committee in the spring of 1980 that we were nominated in two categories: Entertainers of the Year: Bill & Sue-On Hillman ~ Len Henry ~ Ray St. Germain and Female Vocalist of the Year: Sue-On Hillman ~ Rhonda Hart ~ Sheila Dawn. We felt honoured, of course, but felt that we had very little chance of winning since we had always kept a pretty low profile in Winnipeg. We attended the awards and to our great surprise we won the Manitoba Entertainers of the Year Award. I can now sympathize with winners at such awards shows who act so totally surprised and at a loss for words. We had not prepared speech, so we mumbled a few platitudes which didn't really convey the appreciation we felt. Winnipeg hosted the 1980 Big Country Awards (now the annual Canadian Country Music Awards). Since we had received the Entertainers of the Year Award, we were invited to play a string of shows around Winnipeg and the province for the event. 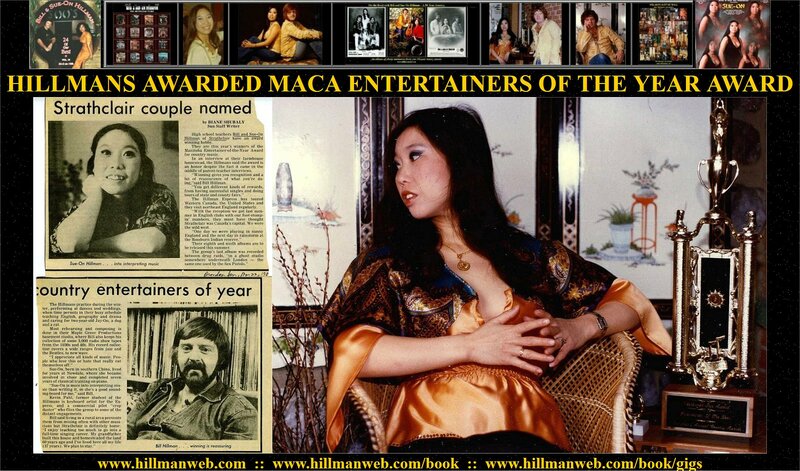 A major appearance was at the Awards Banquet where we sang One Night Stand which had charted in the Top Ten. Following this we appeared on a gala show which was taped for CBC network television at the Centennial Auditorium. Every major Canadian country act appeared and it was hosted by local personality Mike Ried and George Hamilton IV. It was great chatting with George again -- we had played many of the same clubs in England and we had a chance to share memories and compare notes. The +20 piece backing orchestra was led by Bob McMullin and featured the cream of Winnipeg musicians including Ron Halldorson and Reg Keln. We performed two originals: One Night Stand and Cajun Stomp for which the fiddler in the band played cajun licks. The show was shown nationwide numerous times -- everywhere except in hometown CKX-TV Brandon -- but the guys at the board let us into the studio to watch and tape the video feed off the network. Through the '80s we received more MACA Award nominations and were invited to MC, present and perform at many of the shows. 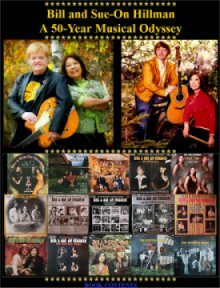 Country stars we appeared with on these shows included Carroll Baker, Eddie Raven, Johnny Lee and George Strait. Backstage chats revealed that both George Hamilton IV and The Family Brown had appeared at some of the English clubs we had played at a few years before. We moved to Brandon in 1992 to take over Sue-On's family's Chinese restaurant -- SOO'S -- which we expanded from 95 to 265 seats. We had a staff of 30 which included our three kids who were also attending university and school: Ja-On worked his way up to become head cook, Robin manned the front reception desk and China-Li became our chief deep fryer. I did renovations, deliveries and books each night after my daily 200 km commute to my 30-year high school teaching job back in Strathclair. Sue-On ran the whole operation: manager, receptionist, cook, and did the inventory ordering, menu planning, staff hiring and training, etc. We specialized in Chinese cuisine for dine-in, buffet, take-out, delivery, caters, and banquets. This was a great experience for Sue-On who is an amazing cook and people person. It was also an opportunity to add Sue-On's popularity as an entertainer to the Choy restaurateur legacy that was so well respected across Western Manitoba. 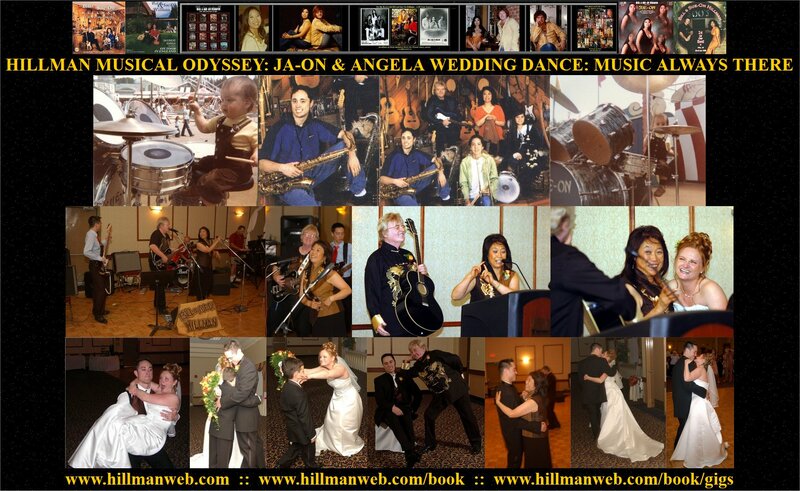 Our 150-seat SOO'S showhall with dance floor, stage and bar in downtown Brandon was a musician's dream. It was a perfect venue for regular jam sessions, band rehearsals and dances. This facility, the largest of our five dining rooms, was also ideal for banquets, weddings, private parties. Even more exciting were some of the special functions we hosted: dim sum banquets, New Years celebrations (both Canadian and Chinese), karate demos and classes, dinner theatre, concerts, holiday events, meetings, and music shows (blues, C/W, choirs, big bands, chorales, etc). Ours was a 10-year plan and in 2002 we and Sue-On's brother Ken sold the property to neighbouring Westoba Credit Union who were expanding their facility into a head office complex. By this time Sue-On and I were also teaching full time at Brandon University. This was quite in character as the juxtaposing of careers in music and education is something we have done all our working years. In the mid-'90s we had a few long phone calls from the producer of CBC-TV's Coleman and Co. with Sandi Coleman. We discussed some of our background and interests which would give Sandi and crew some ideas for questions and filming locations. The show opened with performance clips leading into a long shot of our country home. This was followed by Sandi carrying on with the show's introduction in front of us singing One Day At A Time, with Sue-On on our grand piano and me on acoustic guitar. They then inserted a clip from the CBC archives of us performing at Winnipeg's Centennial Concert Hall. Sandi followed this with a running commentary over a shot of Sue-On directing the kitchen staff at our Chinese Restaurant, SOO'S. The second part of our CBC bio documentary featured footage of us driving back to Brandon on HW 16. During the trip I let the cameraman out on the curve near Basswood so he could get a shot of me steaming along the highway. Another interview led to voice-overs with Ja-On and Robin working at SOO'S and China-Li playing harp in our music studio. A Chinese gong SFX introduced a distance shot of us doing morning Wado-Kai Karate workouts on our upper deck. Later in the day the crew followed us to Elkhorn Ranch at Riding Mountain National Park, where we were joined by Barry Forman, Kevin Pahl and Kerry Morris to play a dance. Some of our songs were taped and the show ended with footage of us on stage in front of an audience of exuberant dancers. Throughout our career we've had associations with many radio stations across Canada, USA and the UK: live shows, commercials, promos, interviews, and a whole lot of record play, but two quite unique projects really stand out. I have huge video and old time radio collections on tape, disc and MP3. For a few years I supplied local radio station CKLQ with nostalgic old radio shows -- comedy, drama, variety, soaps, serials, etc., from the Golden Days of Radio. Working with announcer Jerry Agar (now a major radio/TV host and columnist in Toronto) we featured these shows twice a week in late-night broadcasts. There was, however, more of a music emphasis in the second project -- one of my few music gigs without trusty guitar in hand and lovin' partner by my side. I did a month-long stint as a morning DJ/announcer. Broadcaster Lee Smith had success in British Columbia promoting special events by obtaining short-term radio licenses for his portable CKVN station. Lee's first venture into Manitoba was in Brandon for a Flying Club and a model plane event. He set up low wattage broadcasting equipment in rooms attached to one of the WWII vintage hangars at Brandon Airport. Volunteers from Winnipeg and Brandon's Assiniboine Community College were also assigned on-air stints. I was the Morning Man and compiled my own playlist of rock favourites from the '50s-'80s. A neat experience. I got to play my kinda music, read commercials and news, and did my best at intro and extro patter. Sure missed Sue-On by my side, though. It would have made for more entertaining chats. Coincidentally, around the time that the fledgling CKVN was bombarding the Brandon airwaves, Aaron Kim Johnston's production crew arrived in Brandon to film a major movie. The film was For the Moment and featured Australian actor Russell Crowe in one of his first major roles. The full-length movie feature was set in the World War II era and revolved around the experiences of those associated with the British Commonwealth Air Training Plan. I have a special interest in the BCATP since three of my uncles took their pilot training in the program and I also do the Air Museum Website. Much of Johnston's production made use of the vintage aircraft and hangars at the museum and the Brandon airport which had been a BCATP base, but the crew also moved out to various locations around the Brandon area. Many Brandon musicians were hired to play big band music for a '40s-style dance at Albert Johnson's historic Palladium dance hall. Extras were hired to dress in period costumes and to join the main actors in dance scenes. The well-preserved WWII hangars at the airport served as excellent backdrops for most of the production. I still get a kick out of watching one of Crowe's fight scenes, since it was filmed just outside the doorway of the room that had served as the studio where I had done my morning show broadcasts. Following his initial radio success in Brandon, Lee Smith moved his operation to Winnipeg where retired radio personalities took over the announcing chores for the CKVN nostalgia programming. Russell Crowe parlayed his Brandon success into an even greater success in Hollywood, where he soon became an international film star. I learned later that Crowe was an accomplished musician and fronted a rock band. I also learned that he was bored out of his mind in Brandon. . . if only I'd known, we could have rounded up the cream of Manitoba musicians for some wild jams. We've had a long association with the now-defunct CKX Radio and Television studios. 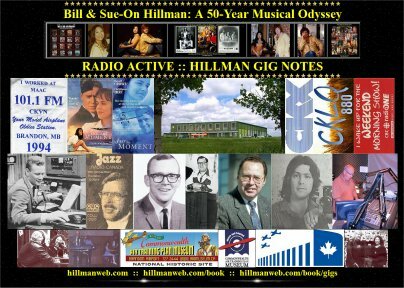 The many decades of our TV appearances are fondly remembered and described in some of our other Gig Notes sections, but radio was also important to us. Jocks and programmers often featured our recordings and as a special favour they even played our album tracks over the test patterns during sweeps periods. This was a boon for royalties, especially since we owned both composer and publishing rights for half of our recorded material. The many remotes we did for car companies, special events, and the summer and winter fairs provided great exposure. Back when FM radio was rather special. . . with no annoying commercials and featuring programming that wasn't usually found on AM radio, we had fun sitting in with well-known musician Gordie Carnahan. He spun our records, we chatted, and had phone-in contests. Gordie had been featured fiddler on CKX-TV back in the '50s in the live shows that pre-dated our later programs. He and Russ Gurr and the Roy Brown orchestra were known all over the Westman area. We had our own local radio and TV stars in those days and CKX is fondly remembered for its service to the Westman area stretching all the way back to 1928. Its loss was a lamentable blow to our community. CKX-TV Brandon in the '50s provided a new and exciting source of entertainment and those homes that could afford sets were invaded by young and old who endured the faint, flickering and snowy black and white images to watch wrestling, Jackie Gleason, I Love Lucy, old movies and local celebrities. I was thrilled to first appear on a series of live noon shows in 1962. College classmate Barry Forman had just had a dispute with the original members of his Country Gentlemen band and we put together a new version of the group. Around this time we even experimented with miming and putting a remote appearance on 16mm film -- really a forerunner of MTV-style videos that wouldn't appear for over a decade later. Sometime during these years we were the first group to make use of the large concrete stage that CKX built on the provincial exhibition grounds (still in use by the Brandon Folk Festival). Previous to this our fair remotes had been broadcast from one of the landmark exhibition buildings. We were also one of the first groups in Westman to expand a weekly evening show into a series of live Co-Op Neighbour night appearances to towns within the broadcast radius. 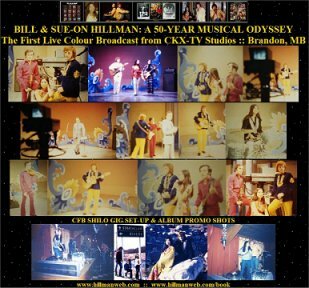 Sometime in the '70s we were honoured to be invited to appear as the first group to be featured in the station's debut live colour broadcast and later anniversary specials. Sadly, Brandon's CKX Radio and Television are no more -- a casualty of the ever-changing and competitive world of broadcast communications. CKX-TV had started broadcasting on January 28, 1955, a memorable day for TV-starved SW Manitobans, but previous to this CKX radio dated all the way back to 1928. The station went dark on October 2, 2009 -- a lamentable day which left our part of the province without a service that had been a integral part of the community for so many years. Weekend mornings for most musicians are a time to sleep in. Late-night gigs are energy sappers: prepping the van and equipment, planning for sitters, battling often treacherous weather conditions, set-ups/tear-downs, four hours of playing followed by what are often long drives home -- sometimes three or more hours. For a number of years we made a point of waking in time to tune in to The Weekend Morning Show on CBC. 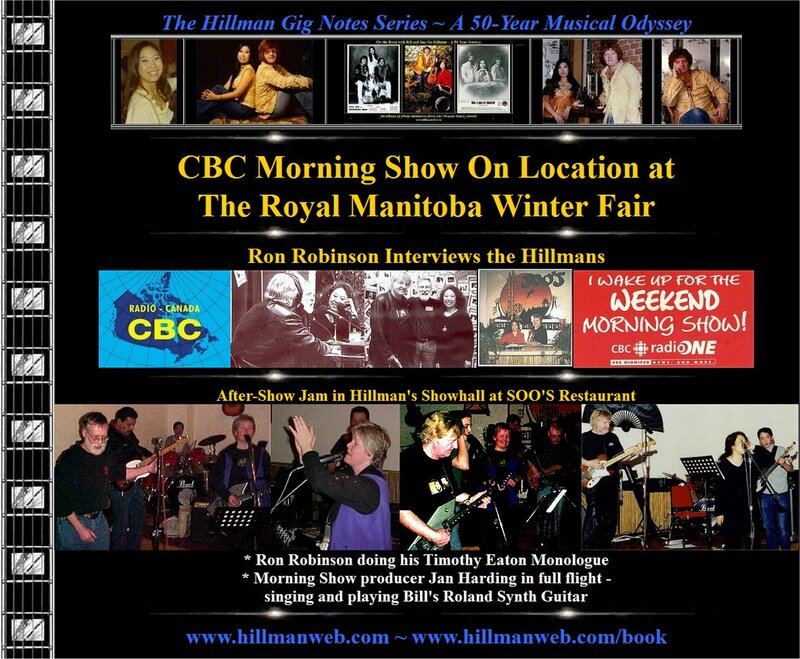 Host Ron Robinson always had an entertaining line-up of music, interviews, news items, poetry, special features and great chatter. Of special interest to us was the recognition he gave us through interviews and playing some of our music. When Ron's show moved into Brandon to broadcast a remote from the Royal Manitoba Winter Fair, he invited us to join him at the booth that CBC had set up in the arena. Ron is an accomplished interviewer so we really enjoyed the show. We invited Ron and the show's producer Jan Harding to join us at our SOO'S restaurant for the regular Saturday evening jam we hosted in our showhall. Many of our regulars showed up, including our son Robin on bass and drums. Jan, a well-known and talented Winnipeg performer (Sally Screw and the Drivers) played my Roland Synth guitar and sang some driving vocals. Ron entertained us with his inimitable monologues and we added musical background to his "Timothy Eaton" poem recitation. Thanks Ron and Jan for adding another dimension and a whole lotta fun to our weekly get-togethers. SHOW BIZ DEBUTS OF THE YOUNG 'UNS All three of our kids -- Ja-On, Robin, and China-Li -- were exposed to music and dance at a very young age. 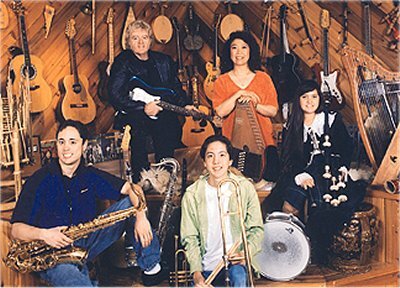 They often joined us on stage and mastered quite an assortment of instruments: drums, sax, trombone, guitar, bagpipes, harp, and keyboards. The first formal training for all three was by way of piano lessons. After we moved from our Strathclair country home to Brandon they carried on with private lessons on instruments and were fortunate to attend schools that had excellent band programmes. Years later, when the boys had kids of their own it was natural that they immerse each one in a flood of music. BOB: Hello. . . Ja-On? BOB: Happy birthday, Ja-On. Archie and I are calling to talk to you on your special day, Ja-On . . . that's a really pretty name little girl. JA-ON: I'm NOT a girl! I'm a BOY! BOB: Oh, I'm sorry, Ja-On. That's a nice sounding name that we haven't heard before. JA-ON: I'm a little bit Chinese. BOB: Oh . . . ah . . [laugh] we really looked forward to speaking with you. [A bit more small talk.] Goodbye for now, little boy. We taped the whole event. An rather unusual, but very funny television debut. Ja's music debut took place a few months later during an outdoor show we did at the Brandon Exhibition. During one of our breaks he crawled up behind his mom's drums and gave the drums and cymbals a real workout to the appreciative applause of the fair goers. From the time he could walk and talk our son Robin was fascinated with his Mom's drums, which we often set up in our media room. He was determined to master the sticks and skins and often climbed up on the drum stool with his mom when we were rehearsing. Even with the stool lowered he could barely reach the pedals but he gave it a game try. His favourite song was the Stones' "Satisfaction" and he actually developed quite a heavy backbeat. It seemed natural then, when we brought the kids with us to one of our hometown gigs, that Robin would make his drum debut. When the big moment arrived he ran to the stage to take over for his mom. We lifted him to the stool and counted him in. As I played the Stones guitar riff a somewhat bewildered crowd wondered where the beat was coming from since the drummer was barely visible behind the drum kit. The kid was thrilled and it started him on a lifetime love of music. China started with classical piano and harp lessons at a very young age. She became a little frustrated though, when she noticed that we learned and performed all our music without the aid of sheet music. She eventually had a chance to supplement her strict learning by notes when we contacted Pearl Carnahan who was willing to give "play-by-ear" lessons. Pearl's husband, Gordie Carnahan, was a well-known fiddler who had been very popular in the early days of CKX live television. The little girl soon mastered rhythmic back-up chording so well that she started to play behind Gordie's old time fiddle tunes. It was a thrill then when he asked her to back him on one of his television performances taped at a Community Club concert. Our wedding day in 1966 was the start of a marvelous adventure, much of which we've shared in this music autobio. 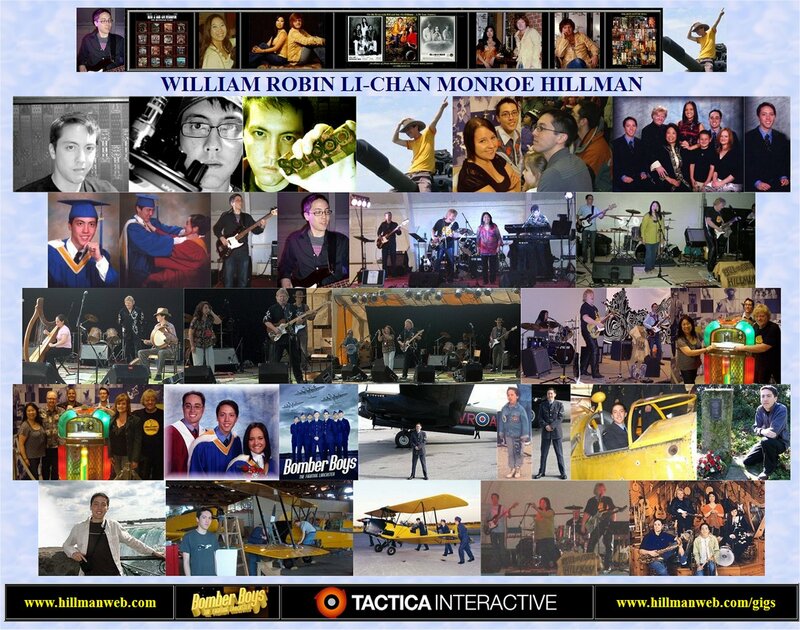 We toured, performed, travelled, recorded, filmed and enjoyed each other for 12 years before our first son, William Ja-On Campbell Hillman, was born. Sue-On was a few months pregnant during our second English tour which slowed us down a bit. She performed right up to the births of all three of our kids so all of them had a very early exposure to music. She stopped playing drums in the latter stages of pregnancy, but swore that the wee ones were keeping perfect time in her tummy. When we returned to the UK for our third tour Ja was a toddler. We carried him for many miles to clubs, markets, castles, and while in London we rode the tube to studios and all the essential tourist spots. Toting the tot with one arm and guitar and suitcases in the other eventually resulted in bouts of bursitis -- but he was certainly exposed to a plethora of sights and sounds. Ja plays guitar, but his instrument of choice is saxophone and for a few years he gave sax lessons at a local music store. 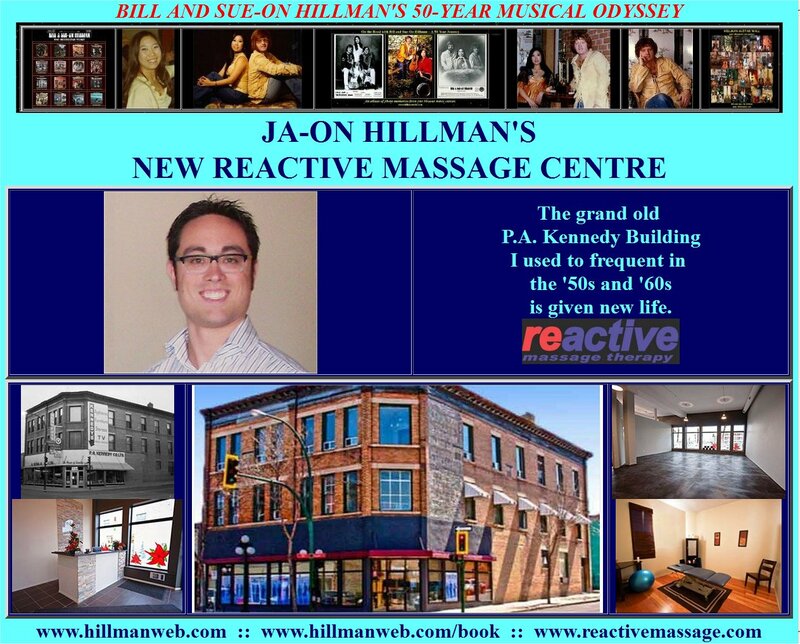 Over the last years his media appearances have been mainly to promote his large Reactive Massage Clinic in downtown Brandon. As with all our kids, music has played a major role in his life. It should be evident to readers of our Gig Notes series that our life events have been played to a background of music. The wedding celebration of our first born was no exception. Ja-On and Angela's first thought for the celebration was to share the occasion with family and friends -- and since cultural traditions and culinary delights are important to both sides of the family, much thought went into their planning in these areas. Since music had always been so important to Ja and the Hillman family the addition of the melody ingredient to the mix was sort of like adding icing to the cake. During the banquet there was a series of greetings and Sue-On and I did a toasting routine -- with a guitar, of course. A DJ had been hired so as to always have music in the background. China-Li was so immersed in her Med School studies that she didn't have time in her schedule to prepare a harp solo but later, for the dance, our son Robin joined us in the music making. Playing for our son's wedding was an emotional event made even more special by the guys who joined us in a mini-band reunion. Robin played bass, Kerry Morris sat at the drums and Kevin Pahl was at the keys -- three great "third man" friends and musicians from various decades past in our music odyssey. Ja-On was much too busy dancing with his lovely bride to join the band. The music was non-stop, since we alternated music sets with the DJ -- a chance for Sue-On and I to join the party-goers on the floor. It was great fun to dance and chat with guests from all over North America - it was the first time that Sue-On's brother Gene and family from Seattle had heard her sing. Keith and Margaret Jones, who had played such a great role in our music tours of England, had even flown over from the UK for the event. The Beat Goes On. 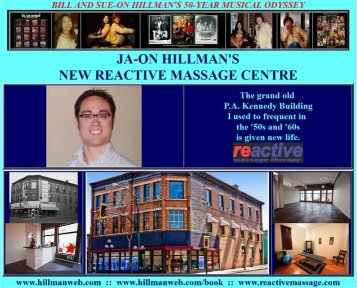 Our son Ja-On's decision to expand his Reactive Massage Therapy centre into the fully renovated "Kennedy" building on Rosser Avenue triggered some fond memories of yesteryear. Back in the mid-50s, one of my consuming interests was music. I looked forward to our family trips to Brandon, which gave me a chance to purchase the latest rock 'n' roll hits on record. A favourite haunt was the P.A. Kennedy Music store, which featured a large display room of radios, music equipment and a great stock of current hit records. In fact, 25 years earlier CKX radio studios had been located upstairs in the building. The most intriguing part of the store for me, however, was the area containing listening booths where music enthusiasts could listen to records before buying them. My first listening experiences all came at 78 revolutions per minute, since 78s were all our old phonograph could play. This emphasis on 78 RPM discs changed just before Chrismas 1956 however, when my mom asked the clerk if could I take Elvis' new 33 1/2 LP record to the listening booth. It was a magic, unforgettable moment when I dropped the needle onto the new vinyl disc. Without my knowing, my Mom later bought the LP and a portable RCA multi-speed record player. Album and player appeared under the Christmas tree that year. For the next decade, and well into my Brandon College years, I made frequent visits to the Kennedy store -- listening a lot and buying what I could afford (singles cost a dollar in those days). At some point the record listening booths were removed. Twenty years later, while on tour in England, I was pleasantly surprised when I discovered that many record stores there still allowed the customer to preview the discs before plunking down pound notes to make a purchase. A parade of memories flood back now when I stroll through the ultra-modern renovations to this same building that Ja-On has made for his wellness clinic. Past the reception area he has converted the music and furniture display room into a large fitness studio. Where the listening booths once stood is now the entrance to rows of massage treatment rooms. There is still music in these rooms, although a bit more relaxing than Blue Suede Shoes. Needles are still to be found, but for a much different use in Dr. Li's adjacent acupuncture rooms. As a wide-eyed kid back in the '50s I could never have imagined the changes wrought by my number-one son 50 years later. The birth of our second son, William Robin Lee-Chan Monroe Hillman, was scheduled during the week of one of our Call of the Wild Festival performances way up in Boggy Creek. In preparation for the birth Sue-On stayed with her Mom in Brandon to be close to her doctor and hospital. I did a solo appearance and was backed by the Harvey Henry band for some of the shows. The very funny folk singer, Duck Donald, took Sue-On's part on some of the duet numbers -- singing in faux gal falsetto. While taking a break from emceeing I heard someone who had received a phone message announce over the PA, "Bill Hillman - you're having a baby . . . ya better scoot." I raced to Brandon in our motor home in time to welcome Robin into the world. Robin is a highly successful computer tech and Web developer in a large Web company in Winnipeg. He even had a major role in a 4-hour BCATP (British Commonwealth Air Training Plan) documentary on the History Channel: The Bomber Boys. In this reality show/documentary he represented three great uncles -- RCAF bomber pilots who had died in WWII. Much of the filming was done on a former BCATP base at Picton, Ontario, followed by shoots at major battle sites across Europe and England. Robin played trombone in the excellent Brandon University Jazz Band throughout his high school and university years. He now plays a major role in our jam sessions and music performances playing bass and spelling off his Mom on drums. 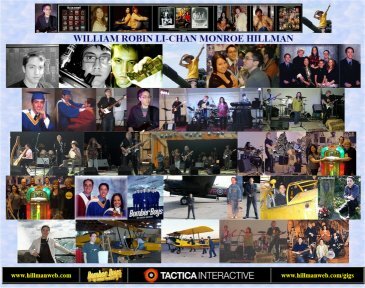 Through the years our son Robin has displayed special musical talents that we are very proud of. From a very early age he excelled in piano, trombone, drums and bass. He played trombone in high school jazz and rock bands and later joined the Brandon University Jazz Band while still in grade 12. He played with that band until he graduated with his B. Sc. Degree. Robin even brought some members of the Brandon University Jazz Band in to provide the horn section for Bobby Curtola when we backed Bobby for a Rock Reunion show. Along the way he played drums with a local Blues band and often joined us in our SOO'S Showhall jams and at the Cantina Jam Club. Noticing that there was an over-abundance of drummers at our jams he taught himself to play bass. This served him very well when he joined our band as "A Third Man" since his mom often handled the drum chores and later we brought in a succession of guest drummers to spell her off. 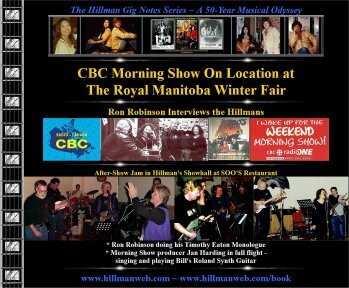 We relied on Robin's rock solid bass work for the succession of gigs we played in later years: Blues Concerts, Folk Festivals (were he doubled on a bodhran for our Celtic numbers), arena dances for Community Reunion Events, Oktoberfests, Fairs, the special Shakin' All Over appearance at the Manitoba Museum, etc. Robin's move to Winnipeg to work for an IT company opened another musical door. He was chosen to play drums and percussion for The Winnipeg Pops Orchestra -- a renowned 60-piece orchestra that has thrilled live audiences for over 60 years. 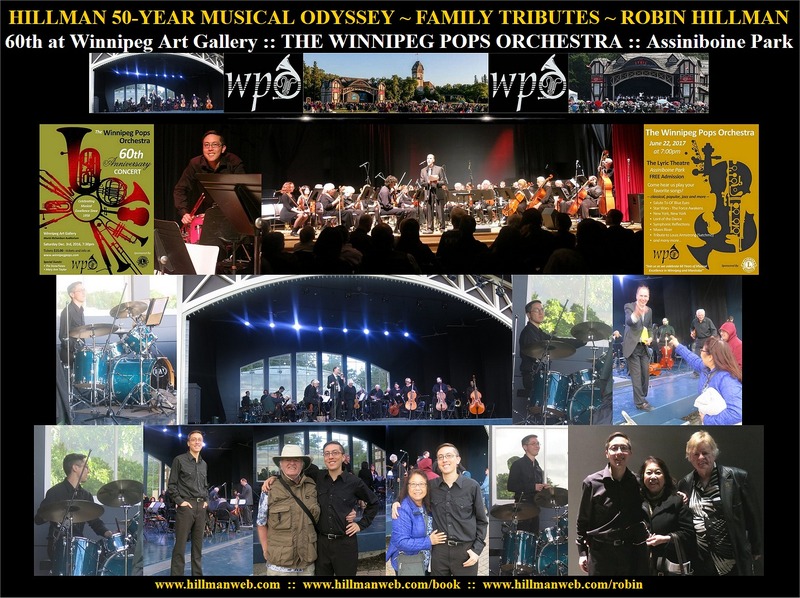 We were thrilled to attend the special 60th Anniversary Concert of the WPO at the Winnipeg Art Gallery Auditorium. We were also fortunate to be able to attend their show at the outdoor Lyric Theatre in Winnipeg's Assiniboine Park on the second day of summer. The day was chilly, windy with threats of showers but the crowd was kept warm and enthralled by the wonderful variety of music from the orchestra led by conductor Dave Schmidt. Robin's incredibly diverse background in so many styles of music served him well -- his drums and percussion were right on. China-Li Jade Ma-Ri is our little sweetheart, who has grown into a very beautiful young medical doctor specializing in radiology. She amazes everyone with her ability to succeed in everything she touches. Before entering Med School she was involved in a long line of pursuits including: writing, computers, highland dance, guitar, knife-making, fencing, cooking, arts & crafts, Web design, and academic achievement. China has specialized in playing harp, bagpipes and piano/synths and has been invited to play at weddings where she has played all three of these instruments during the ceremony. We have played at Folk and Celtic Festivals where her talents on these instruments have made her the star of the show. Her talents have been showcased in the media and she has appeared as feature harpist at music festivals and with university orchestras. In recent years, however, her very demanding studies and dedication to her profession in medicine have taken precedence. Sue-On's mom and China-Li's grandmother, Jade Choy, lived an incredible life throughout her 101 years. She survived the Japanese invasion of China and later lost her home and possessions when she was imprisoned by the Communists. During these years she raised her children by herself and even managed to smuggle toddler Sue-On out to Hong Kong where she was raised by her grandparents. Her life was so amazing, in fact, that when documentary filmmaker, Graham Street was planning films on the lives of famous Manitoba people, he chose to include Grandma Choy in a 6-part MTS series: Postcards from the Past. Sue-On and I helped by providing photos, memorabilia, and information on the lady's life, but he wanted a young actress to portray Jade as a young girl in China. The Chinese garden at Winnipeg's Assiniboine Park was picked as the film location. . . and to our delight the actress chosen for the role was our multi-talented daughter: China-Li. When our daughter, China-Li (cheena lee) was very young she took harp and classical piano lessons from Ann Germani at her Music Studio in the former Bank of Montreal building on Rosser Ave. in Brandon. She was fascinated, however, with the way we played our songs without using written music -- so, to round out her musical education, she also took by-ear piano lessons from Gordie Carnahan's wife, Pearl. A treasured TV performance, that we recorded off air, features veteran performer Gordie playing some of his original fiddle numbers and being backed by our little China-Li on piano. She was so young that her feet dangled from the piano bench, but she pounded out a great backing rhythm for Gordie's tunes. It wasn't long before she moved on to playing her mom's keyboard synths. I guess the Hillman passion for music is in China's genes. When she learned that our retired neighbour, Don Roy, had played bagpipes with the famous Black Watch, she became very intrigued with this rather unusual instrument and asked Don for lessons. Already her Scottish heritage had led her to join a Highland dance troupe, so a move to the pipes wasn't all that surprising. She learned first on a small chanter and soon bought a full set of pipes. Her next purchase of electronic pipes enabled her to play folk and Celtic concerts with us. We have photos of a completely different gig China did, though, in the Centennial Concert hall a few years later. The Brandon University Music Department put on a concert where their orchestra was augmented by a large group from the USA. China-Li performed as the featured soloist and accompanist with her concert harp set up at the front of the stage in front of this pack of university performers. The kid was, and is, an incredibly talented musician, but her main focus is on medicine and she is now a dedicated MD and radiology specialist. Radio has been an old friend for as long as I can remember. Radio was an imagination generator and the waves that floated in through the big speaker of our Westinghouse floor model or through the tiny ear phone plugged into my Standard transistor radio introduced me to so much that would stay with me for decades to come. So many different genres of music, but also radio theatre: comedy, drama, variety. My memory could capture only so much -- there was no way to capture and file this material. But a wonderful gift from my parents in the early '60s changed this: a small reel-to-reel tape recorder. All my spare cash was spent on purchasing blank tape reels from our family Marshall Wells hardware store. Soon I was building up a library of my favourite music and shows by putting a mic in front of the radio and TV speakers (I later wired in a jack for a direct patch) -- video recording would not become possible until way into the future. Now I could have an audio record of our live TV shows from CKX and my mom and sister Bonnie faithfully set up the mic to tape these broadcast epics. I even captured many of the early Guess Who appearances on the CBC Let's Go show. I still have those broadcasts among my thousands of OTRadio shows on tape reels. As technology progressed, so too did my taping obsession -- especially after we set up a satellite dish in 1980. This has led to a gigantic library of many thousands of video tapes and DVDs which reflect my love of classic movies, docs and music concerts. A great resource for any musician. It's a bit scary though, to see how quickly different formats fall by the wayside. I've drawn inspiration from this long line of recording media: 10" gramophone discs, 78s, 16" ET discs, LPs, EPs, reel-to-reel tapes, cassettes, 8-tracks, surround sound, CDs, DVDs, MP3s, etc. Also included in this aural graveyard are the many tapes from our recording sessions: 1/4" and 2" masters from 8, 16 and 24 track sessions. As a prairie farm kid growing up in the '50s with my ear pressed to a radio speaker I could never have guessed what a major role radio would play in my life in a few years. In the early '60s we started doing live radio and television broadcasts from the Provincial Exhibition grounds. I didn't know it then, but doing our shows surrounded by all the hoopla and excitement of the fairgrounds was a harbinger of what we would encounter on our later summer tours. We also did a series of radio remotes from city car lots promoting their latest models and deals of the week. Most of these spots were to showcase the latest fall models and since we often performed on outdoor lots we often had to play under great duress -- trying to finger the instruments in sub-zero temperatures. A few years later Sue-On would take this type of thing a step further by doing a series of televised car commercials. While on tour with the Federal Grain Train we visited the studios of many radio stations along the way to do promos for the night's show on the fairgrounds. Many of them asked permission to broadcast our evening shows for their radio audiences. The sound quality must have been dismal since the signal that went out came from a single mic placed in front of one of our PA speaker horns. It is ironic, considering all the trouble Sue-On's family had in getting out of China that, for a while, Beijing became one of our largest radio audiences. Sue-On's brother-in-law, Wai Kai was captured by the authorities after having paid to be smuggled out of the country by boat. It was 17 years before he was able to join his wife and daughter in Canada. After coming to Brandon, he stayed in touch with a friend who had been assigned the job of music programmer for Radio Beijing. When China relaxed its ban on 'things Western,' there was a great thirst for music from America and some of the first imported tapes they heard were ours -- Choy revenge? Today pretty well anyone with a good mic and the right computer software can produce a CD, MP3 stick or upload songs for Internet distribution. Back in the '70s and '80s, though, recording was more of a big deal. We spent many hours in studios in Winnipeg and across the UK before and after our tours there. 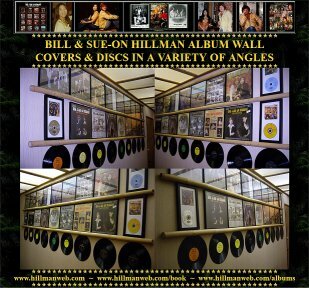 We turned out 12 albums and were very involved in the entire process, including the financing and promotion. There were no grants, promoters or commercial backers -- we had to do it all, including the jacket design, photography, liner notes, etc. To encourage off-stage sales we recorded many cover songs that we featured in our stage shows. To promote radio play we wrote half the songs we recorded. Pretty much every recording format from the early days of Edison to present day digital was used either for inspiration or in the actual recording process. Songs were written at piano or on guitar, passed by Sue-On and then put down on paper and tape while still fresh in mind. They were then tried out on stage where they were either culled or polished for recording. During the first studio sessions we recorded backing tracks over "work vocals." The next session was reserved for lead and backup vocals and sometimes the adding of a bit of sweetening from synths or guitar. The final session involved the mixing of the songs from 8, 16 or 24 tracks down to a stereo mix on 1/4" tape on 10" reels. The songs were then put into the desired sequence for the A and B sides of the album and sent for mastering. Once we approved sound quality via a test pressing we designed the covers and ordered discs and tapes from pressing plants in Ontario. As soon as the shipment arrived we started mailing out promo copies to radio stations and distributors and began selling the product off stage. A long, costly and exhausting process -- but O so important to keep the creative juices flowing. Our recording projects were a great learning experience and we started to listen to music with very different ears. 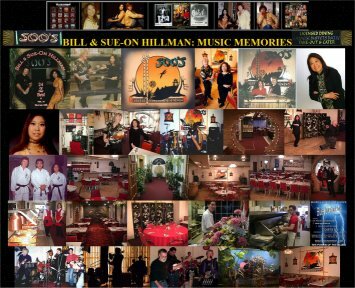 Sue-On and I did many of the instruments and pretty much all the vocals for our almost 100 recorded songs. This was before vocal harmonizing, doubling and pitch correct devices were invented. We would record our solos or duets and then add harmony or doubling vocals over the original tracks. Reverb and sometimes tape delay or slapback echo were usually added. I would record bed tracks with two acoustics in stereo - one of the guitars tuned to high bass or Nashville tuning. I'd then add back-up and lead electric guitar tracks. Sue-On played drums on about half the sessions and added percussion effects on most. On a few numbers we added hand claps and I even played "drum" rhythms on a guitar case or box occasionally. I sometimes turned to my sound FX library from which I mixed in the sound of wind, hounds, gunshots, etc. on some numbers. During the mix we added studio effects such as EQ and flanging. On some numbers we punched in notes in sections that were a little weak and experimented with slowing or speeding up the tape. We sometimes edited out or put in verses and intros by razor blade-cutting and joining with splicing tape. Playback was listened to through large studio monitors in the control room, but on songs we thought would make good singles release we did separate hotter mixes while listening to the playbacks through small car radio size speakers. On one of the sessions I couldn't get enough overdrive out of the large studio amp . . . rather than turning it up to 11 and rattling windows with high volume I placed a mic in front of my tiny Pig Nose practice amp which sounded like a wall of Marshalls in the mix. We've worked with fantastic keyboard musicians through the years: Sue-On, Larry Clark, Kevin Pahl, Alan Jones, Kenn Jarvin, Bernie Watson, John Ashcroft, and Alan Clark of Dire Straits, but for one of the sessions I wanted to get into the act. We rented the Fender version of a Leslie rotating horn amp which allowed me to play some organ effects with my Telecaster and volume pedal -- a short-lived experiment . . . pretty hard to replace the real thing. The Jones-Blair-Hillman association goes all the way back to the early '60s when Al Jones first came to Canada to work as a physiotherapist in Brandon. Ken Blair, Doug Brolund and I were playing as The Blue Angles instrumental trio in which my guitar was the only lead instrument -- 4-hour dance jobs featuring nothing but the popular guitar instrumentals of the day. We were thrilled when Alan agreed to join the group and add sax, piano and organ to our sound. I was even more excited when Alan offered to contact his brother, Keith, in England and have him send over guitar albums by the Shadows. I was already a great fan of Lonnie Donegan, skiffle and trad bands, Cliff Richard, and all the other giants of the British music scene whose records were rather difficult to obtain in Canada. This series of events added tremendously to our band's repertoire. Eventually the band dissolved, Sue-On and I married in 1966, and we went on to other musical pursuits. Alan, Ken and I drifted apart . . . until almost 10 years later when Al contacted me. He played some of the songs he had written and asked if Sue-On and I would like to join him in a recording project. He also enlisted the aid of Ken Blair and two other fine musicians with whom he had played with back in England -- Terry Fleetwood and Ian Hunter. 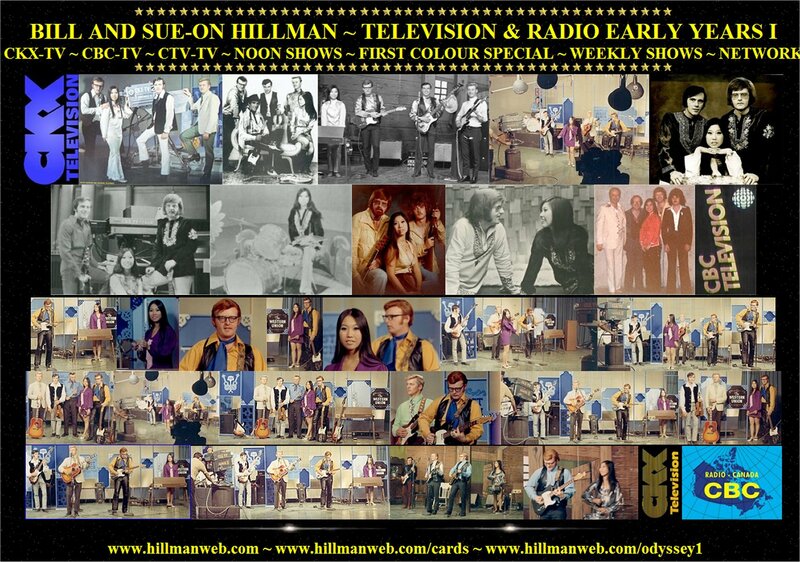 At the time, Sue-On and I were spending much of our free time, while off the road and away from our teaching duties, working at a multitude of recording sessions in Winnipeg's Century 21 Studios. This looked like another challenging venture so, within weeks we were again back in the studio. The two studio engineers were John Hildebrand, co-owner of the studio, and Colin Bennett, who had previously been musical arranger, etc. for the RCMP Musical Ride band. The songs were all originals by Alan, Ken, and myself. Sue-On and I sang three lead vocals. One of the sessions turned out to be an almost all-night marathon. Sue-On was part of the reason for this long session. She had spent most of the day sick in bed with a bad cold, but gamely made it to the session to do back-up vocals. She held up fairly well, but as the session dragged on into the night, she started to experience sharp pains in her chest and had difficulty in breathing. The three physiotherapists in the group correctly diagnosed the problem as pleurisy -- and tightened a belt around her chest to ease the pain so she could finish the background vocals. She could only sing two sustained notes at a time, but thanks to overdubbing we strung it all together. When the pain became too severe I took her to the hospital for treatment. This was one of our few recording projects in which Sue-On didn't play drums. The drum work was ably handled by Ian Hunter, who also did a great job doubling on sax. The songs are performed in quite a variety of styles -- many of them showing the influence of the guys' British roots -- and they have stood up amazingly well and are still great fun to listen to. I look back with awe at Al's unique songwriting and keyboard work, Ken's bass work which met the challenge of such an eclectic musical mix, and Terry's quite incredible vocal style. This was probably the last recording session in which I used my original Telecaster with Bigsby and my home-made B-bender, and after listening to the sounds of the instrument I'm tempted to come full cycle and make more use of it in future sessions. The album cover was designed in keeping with the "Free Spirit" theme. The photo was taken at Brandon Airport with all of us gathered around Ken Gowler's famous bi-plane with plenty of open blue sky in the background. The bi-plane from the cover eventually went on permanent display, hanging from the terminal ceiling at Winnipeg International Airport. Kevin Pahl, our keyboard player in our other band, was one of the few pilots who flew it before it was "dry docked." Fittingly, since Sue-On and I were in the middle of yet another project that day we made it to the photo shoot thanks to Kevin's father, Howard, who flew us into Brandon on that afternoon. 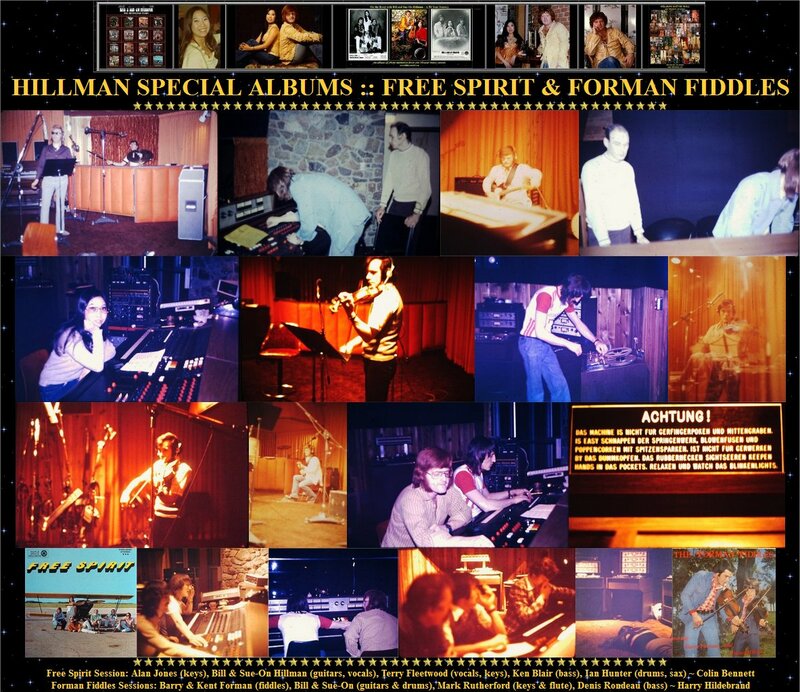 The back cover followed the theme created in our previous album: film strips, credits and liner notes. Soon after the release of this album, Alan returned to England for a visit with family. While over there, he approached an agent and interested him in booking us for our '76 tour of England. We did a series of 30 nights in halls and clubs with Sue-On on drums, Kevin Pahl on electric piano and keyboard bass, myself on guitar, with Alan joining in on organ in the clubs which had one available. 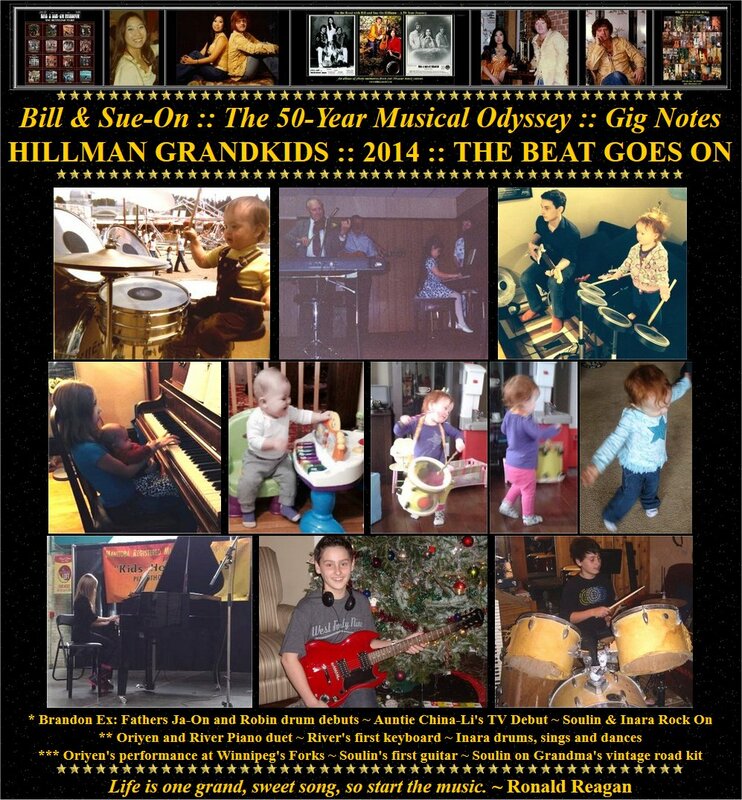 At the end of the tour we recorded five songs for Hillman Album No. 6 in a London Soho studio. Sue-On and I returned to England again in '77 and '79 for more tours and recording projects, but by this time Alan's professional career in health care had taken him to Victoria. Sadly, Alan Jones passed away in 2014. Barry Forman, a longtime friend and bandmate, played bass and fiddle on our Canadian recording sessions for our first six albums. During those years Barry, Sue-On and I played countless live gigs across Canada and the US. Barry and his wife Bette and their three kids were almost like family to us. We proudly watched their son Kent hone his talents on violin from a very early age . . . he had inherited his dad's fiddle skills. In later years Kent went on to become a fine violinist and played in symphony orchestras in Canada and the States. It was a thrill then, when we had the chance to play on Barry's two fiddle album sessions in the '70s -- one of them also featuring his young nine-year-old son, Kent. This actually launched the start of a very popular performing duo -- The Forman Fiddles -- that went on to great success. These two albums were recorded at Century 21 Studios and released on Alex Groshak's Winnipeg record label, Sunshine Records. Sue-On and I had played on these tunes many times over the years so it was a real treat to be a part of getting them down on wax. I played all the lead and rhythm guitar parts, Sue-On did all the drum and percussion tracks and of course Barry played the fiddle tracks - some of them duets with young Kent. To achieve more of a live backing sound Barry invited our friend Denis Rondeau to play bass. We were delighted when talented Winnipeg musician, Mark Rutherford agreed to also play on the session. Mark, who was well-known from his work with popular singer Diane Heatherington, played piano and organ parts. . . but what really made the tunes distinctive was his addition of flute to the mix. Engineer on the sessions was Harry Hildebrand, who had worked on our second album, years before. 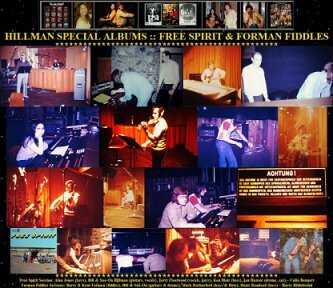 "This album contains seventeen of his most requested fiddle tunes. These tunes have been arranged by Barry. The result is a most refreshing approach to old time fiddle music. The Forman Fiddle style is the culmination of his early violin training with Mr. Alex Whyte, the Canadian fiddle stylings of his father, Lorne, and the influence of the well known Country Rock Trio - The Western Union. This fiddle style is being passed on to his fiddler son Kent. Kent is nine years old and is Manitoba's Junior Fiddle Champ. The Musicians on the album are no strangers to the music scene. 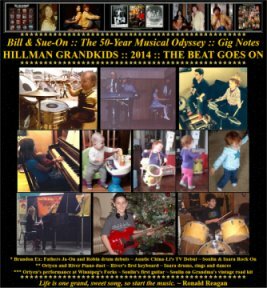 Bill Hillman does all the guitar work with Sue-On Hillman on drums. Denis Rondeau plays bass and Mark Rutherford does piano, flute and organ. Barry, a former school teacher, now has the Ford and Mercury dealership in Rivers, Manitoba. It's now Fun N' Fiddle with Forman N' Ford. Enjoy the album." While on a two-month tour of Malaysia and China we received a wonderful surprise e-mail. 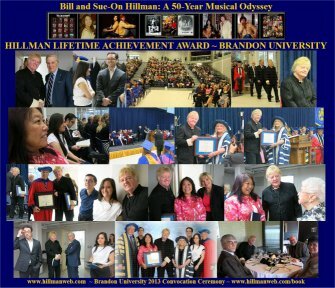 I had been selected for the Brandon University Lifetime Achievement Award. This came about from a nomination by Dr. John Tyman the founder of the BU Geography Department, now retired in Australia. Supporting the nomination were Jerry Storie, former Dean of the BU Faculty of Education and Stephen Hayter, Executive Director of the Commonwealth Air Training Plan Museum. The award presentation would be at the BU Spring Convocation -- and fortunately we were scheduled to return to Canada a few days before the ceremony. We were thrilled to learn that also honoured would be legendary broadcaster, Lloyd Robertson. "In 1961, William "Bill" Hillman enrolled in the BSc program at Brandon College. Shortly after moving into the Men's Residence, he gave his first musical performance in the city on a flatbed float during the Brandon College 'Freshie' Parade. The twin paths of education and entertainment were set. 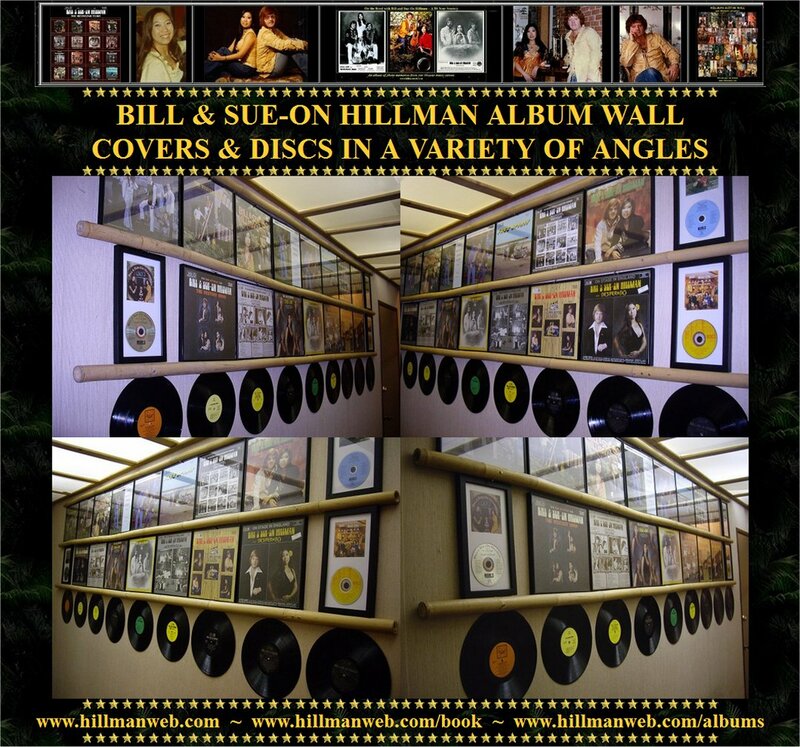 Over the next 50 years, Bill and his wife Sue-On would perform for countless audiences earning the 1979 Manitoba Music Entertainers of the Year Award for Country Music. Their musical repertoire included rock 'n' roll, country, big band, folk, western, old time, rock, bluegrass, pop, gospel, Cajun and even original music. Bill graduated with a Silver Medal and a BSc degree in geography and later became the first Canadian student to earn an MEd at BU in 1991. 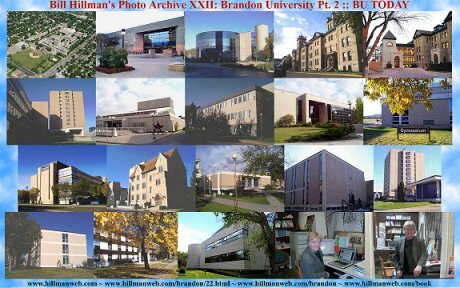 While teaching with the Faculty of Education, he worked with former BU professor John Tyman to compile the massive online "Cultures in Context" resource, featuring thousands of notated photos (www.johntyman.com). Bill has volunteered countless hours to organizations including the Commonwealth Air Training Plan Museum, XII Manitoba Dragoons, Brandon Mental Health Centre, Westman Chinese Association, as well as events for First Nations, music, culture and education. Bill retired in 2011 as an Assistant Professor with the Brandon University Faculty of Education." I was the recipient of the 2013 Brandon University Lifetime Achievement Award. This prompted me to look back over the last 50 plus years. 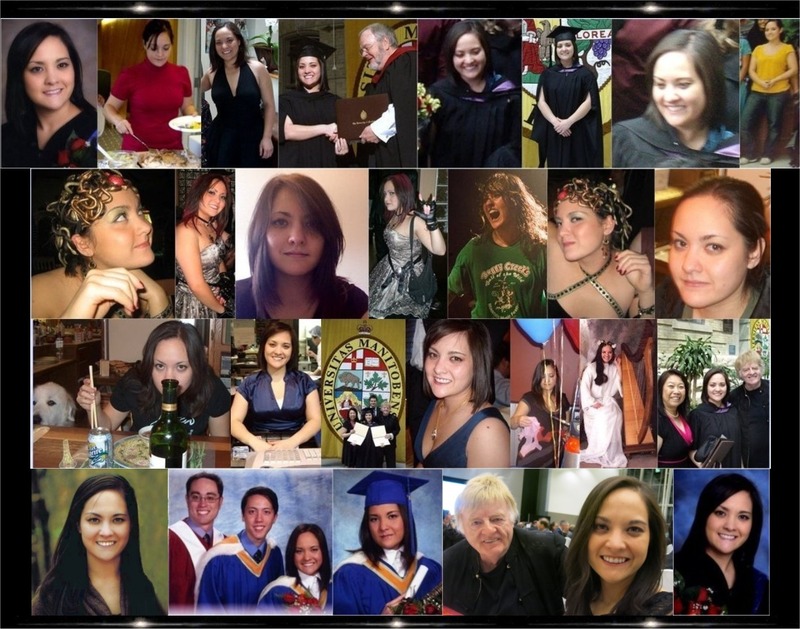 In doing so I was struck by the number of experiences that my music and my years at university and as an educator share. * I enrolled in the 1st Year Bachelor of Science programme in 1961, the year the Men's Residence had just been completed. This was my first time away from home and I remember that my Silvertone guitar was a real friend that helped overcome homesickness. In fact, one of the photos taken from that first year in res has circulated all over the Internet wrongly identified as an early photo of Guess Who founder, Chad Allan. Looking out my dorm window to the east I watched construction of the new dining hall. I and a couple of musician buddies were the first to use the building, but not for dining. I sometimes jammed with the College Combo in the newly opened Evans Lecture Hall a few times, but it was easier to get into the unfinished dining hall. We spent many evenings clearing away the paint pails and gyproc in the unfinished basement to set up our amps in plaster dust for rehearsal sessions. * When John Tyman founded the new geography department the next year, I was in his first course -- but ran into a problem. Luckily, he gave me special permission to skip many of his noon hour classes so that I could play guitar on the daily Noon Show at CKX-TV. Later I enrolled in Prof. Lorne Watson's first music course in the new Music Building. The course concentrated on the history of Western Music: composers, symphonies, opera, etc. The main attraction for me though, was the listening labs with headsets where I smuggled in my new stereo albums: Johnny Cash, Frank Sinatra, Elvis, Marty Robbins, Nancy Wilson, etc. * When I ran out of funds I returned home to teach high school on permit, play bars on weekends -- and to marry my soul partner, Sue-On. After three years we had saved up enough to return to BU that had just been awarded university status. To help pay tuition we played bars every night -- even backing the first exotic dancers to appear in Brandon. I finished off two degrees in three years, won a Silver medal . . . and received the first B.Sc. awarded in Geography by BU. Decades later, while still teaching full time at Strathclair Collegiate, I did daily commutes for over a year to receive the first Brandon Education Masters degree awarded to a Canadian student, which led to my being hired full-time as an Assistant Professor at BU. Throughout all these years my music was a common theme in all the assignments, projects and theses. I create and maintain the Websites and Webzines for Edgar Rice Burroughs, Inc. of Tarzana, CA -- over 10,000 and counting. 2012 spawned celebrations all over the US in recognition of the Centennial of the creation of ERB's two best-known fictional creations: John Carter of Mars and Tarzan. To cover these events we spent months on the road and in the air travelling coast to coast and border to border. During these trips music was never far from our thoughts and we made a point of making many side trips to historic music locations to explore the places that had inspired ourselves and so many other musicians. Many of these areas honour their homegrown music legends with elaborate bronze statues. 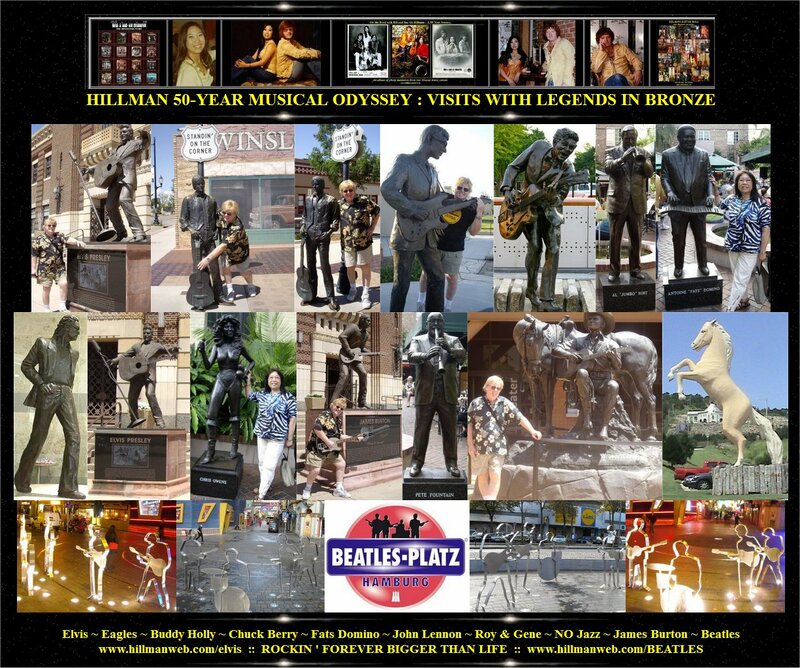 Along the way we compiled a wealth of music research including a photo file of these bronze memorials. A Telecaster and Gretsch Americana acoustic guitar accompanied us on all these trips. We are always on the lookout for opportunities to jam and pick and sing. Our quest for the bronze began in March 2012 when the Disney Studios invited us to fly to their lot for an exclusive pre-release showing of their John Carter of Mars film. While in LA we spent an afternoon at the Autry Western Heritage Museum where we collected our first bronze: Gene Autry - the original singing cowboy. Later in the summer we drove south to visit friends in California's high desert where we spent time in Pioneer Town, the cluster of buildings where another singing cowboy, Roy Rogers, filmed most of his movies and TV shows. Since we had taken a photo of Gene's horse Champion, I was prompted to dig out a photo of the statue of Roy's horse Trigger that we had taken on a previous trip to Branson, MO. The next stop was Winslow, Arizona where one of the Eagles in bronze is on display standing on a corner beside a flatbed Ford. Buddy Holly is remembered in bronze at the Holly Museum in Lubbock, TX. We took advantage of our trip to the Louisiana bayous, where the first Tarzan film was made in 1918, to loop over to New Orleans' French Quarter for photos of Fats Domino and many of the jazz legends honoured there. A visit to the home of the Louisiana Hayride in Shreveport netted some great photos of the Elvis and James Burton statues. On our way northward we spent time at Sun Studios and Graceland in Memphis, but struck out in our search for statues. The final statue in the series is one of Chuck Berry from St. Louis. Images of all these statues are displayed in the photo section of this book to which we've added statues of John Lennon in Liverpool and the photos of the Beatles statues on the Reeperbahn in Hamburg. The Beatles photos I took a few years earlier while in Hamburg to attend Phil Collins' Tarzan Musical premiere. It was on these long trips around America, however, that a few serious trail hazards caught up with us. I suffered two kidney stone attacks -- the second one had to be broken up by laser in hospital. The long hours behind the wheel resulted in blood clots in the legs which had to be treated with injections and rat poison medication. And on the final trip home our car suffered $1,200 damage on the freeway when a rubber chunk from a semi's tire blowout was spun up into the front wheelwell of our Honda. We survived all of this, piled more memories into our musical memory trunk, and lived to play another day.